We have another Christmas stocking stuffer from my sister 'Thepresidentofcookies'. 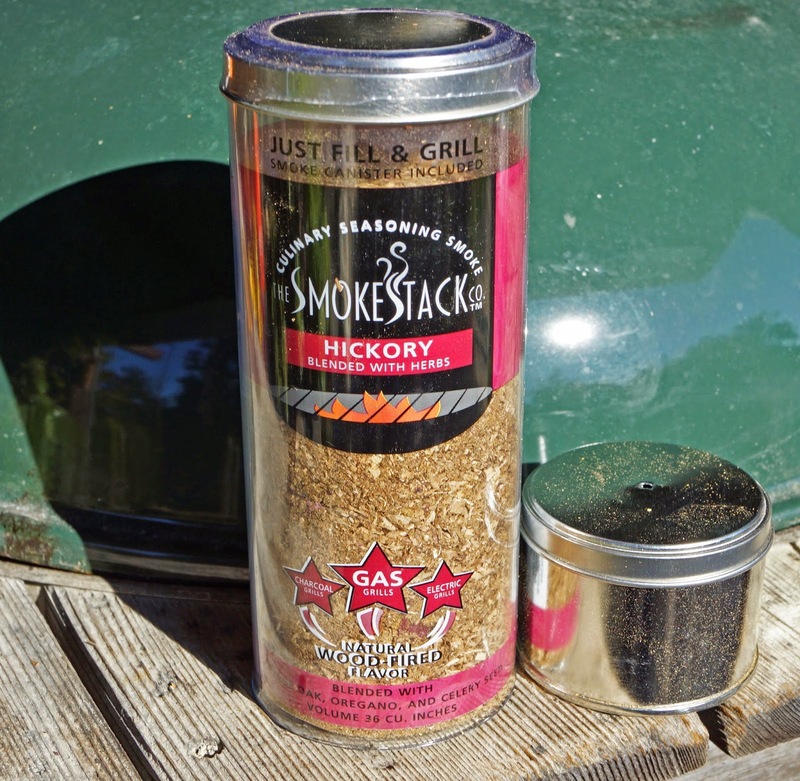 The Smokestack company has created a culinary seasoning smoke that is delivered in an easy convenient to use product. They offer different flavored smokes such as: hickory, mesquite, alder and applewood. These different woods have different meat flavor applications. What really differentiates this product is the addition of herbs and spices to the smoking woods. The wood and spices come in a resealable plastic container that is good for approximately 6 uses. This tube also contains a metal cannister with a hole in the top that holds the smoking material that is put on the fire to produce smoke. This product should be easy and convenient to use. 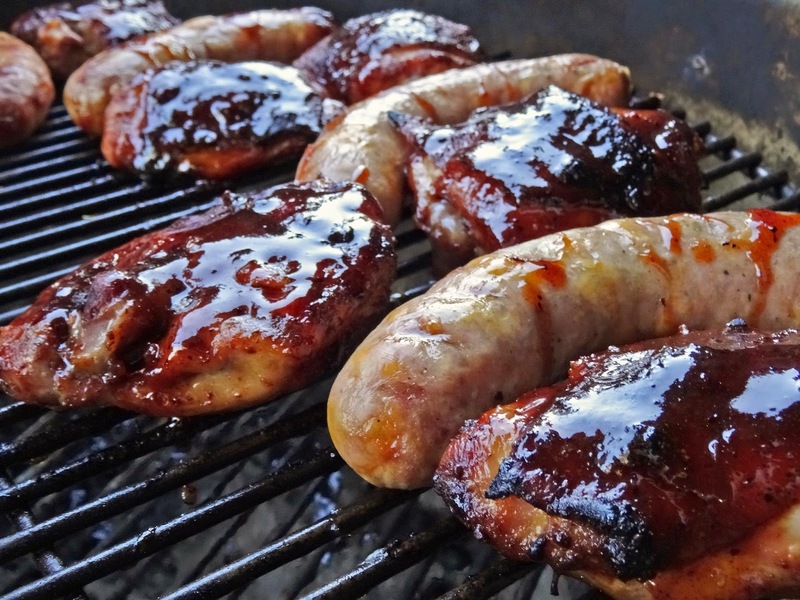 We are going to try the Hickory flavor today on some chicken and sausage on the grill. Pull up a chair and watch the Smokestack works its magic. This hickory wood also has the addition of vintage (?) oak, oregano and celery seed. The company recommends using this flavor with beef, chicken, lamb and vegetables. We built a charcoal fire using approximately 40 lit charcoals. They were placed on one side of our covered kettle grill. We then placed the Smokestack on the lit charcoals. Almost immediately smoke billowed out of this small container. The grill was put into position. The bottom vents were opened half way. The food was placed on the grill on the side away from the fire. The lid was put into positioned to create a indirect fire smoking chamber. Houston we have smoke-off. The aroma was of hickory. One hour later our smoked meal was ready. My sister, 'Thepresidentofcookies", knows my passion of all things bacon. This Christmas she gave me a package of 'Jalapeno Bacon Jerky'. Not only do I get bacon but the added bonus of jalapenos another favorite food group of mine. 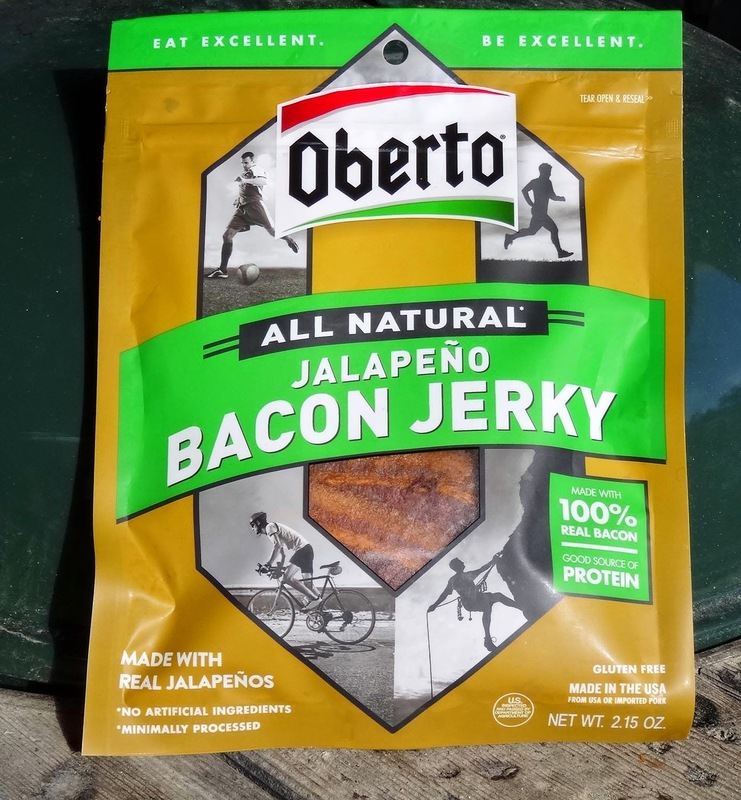 The company of 'Oberto' claims that this is an all natural 100 percent bacon product. I tend to be a little skeptical of such loud boasts because of past experiences. I have heard 'The proof is in the pudding'.It is an old saying that basically means you have to try it for yourself. If you want to know more than necessary about the origins of this saying. HERE Let's give it a try. 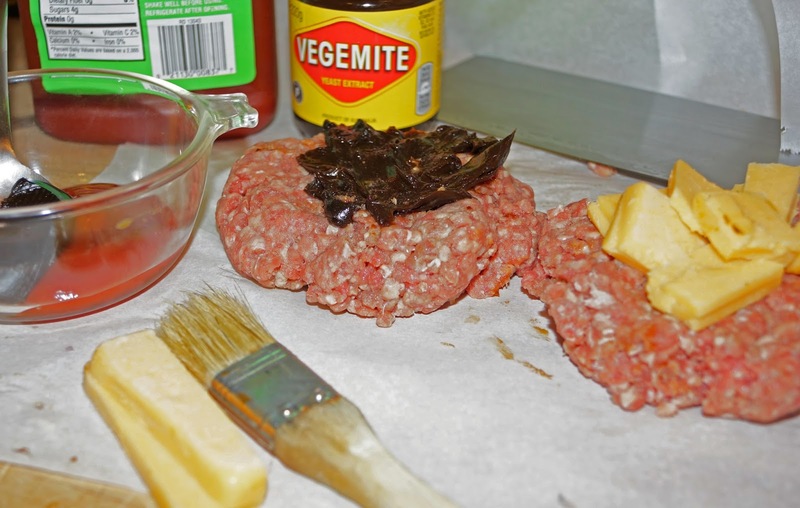 Pork, water, salt sugar, natural flavors, dehydrated garlic, dehydrated onion, chipotle pepper, jalapeno pepper, citric acid and tomato paste are the listed ingredients. I listed the ingredients because I was impressed of the simplicity. No chemicals, binders, msg, or ingredients of mass destruction. The package is opened to reveal actual strips of bacon. The aroma is of onion and pepper. The texture is soft and a little limp. I bite into this so called jerky and am pleasantly surprised of its layered flavor sensation. I taste bacon because it is actual bacon. The tomato paste, onion and garlic adds a nice flavor component. The jalapeno comes at you in the end. The flavor and a slight mild heat leaves you clapping with flavor contentment. I liked the salt level but Ms. Goofy said it was too salty for her fancy. This is some good tasting jerky (?). The downside of this product is the texture. I think of jerky as a chewy food that gives your jaw a little work out. The texture is soft. I am not sure this is a bad thing. I liked this product. 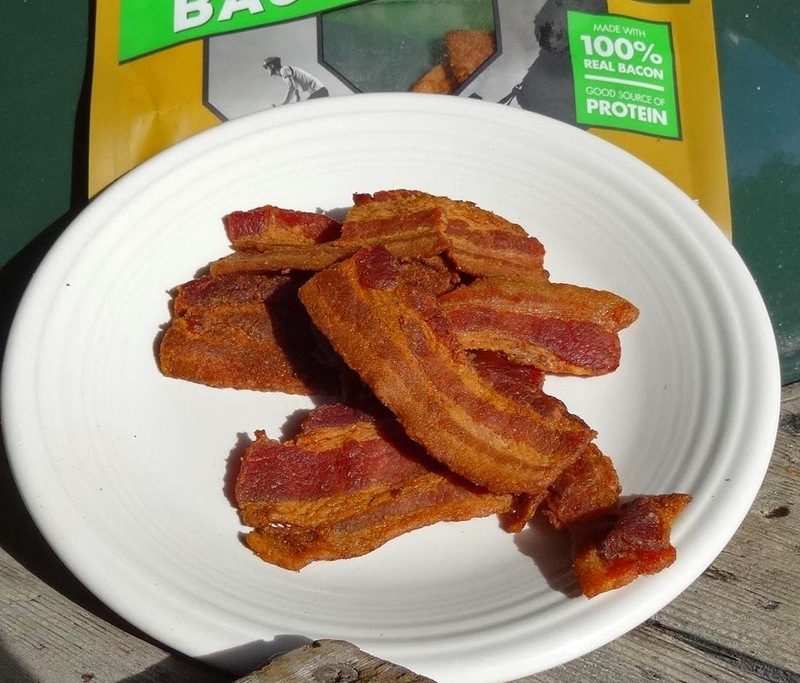 It would be great for bringing bacon on a camping trip or in my case a trip to my favorite couch. So long. 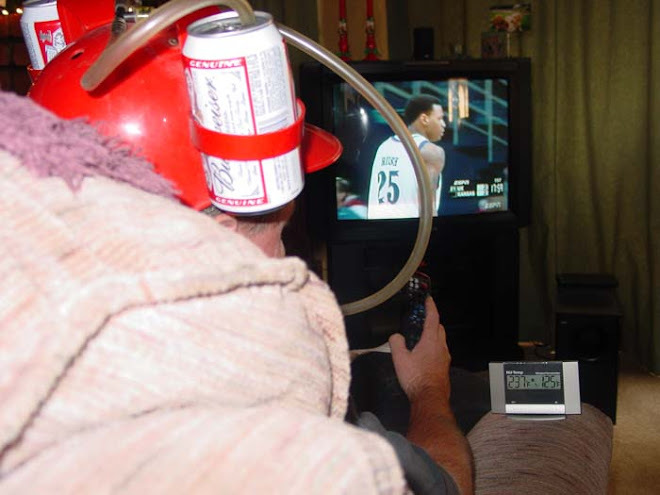 We all have our traditions at this Christmas time. Tradition can be in many forms: worship, festivities,decorations and of course food. 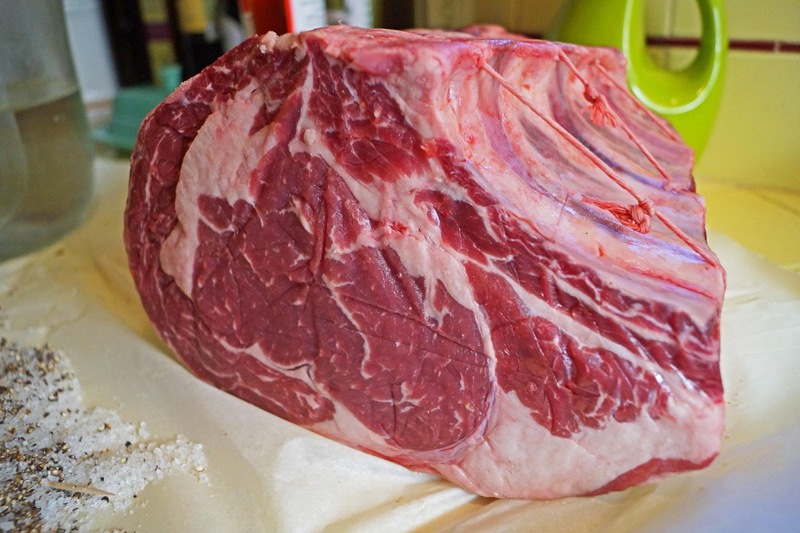 A Mad Meat Genius tradition is to feast on prime rib Christmas day. We like to find the best beef available and spare no expense. We have been to many local butchers, big discount warehouses and even Wally World. They all have decent products. None compare to the aged prime rib roast at Willowside Meat market in Santa Rosa. They hang the roast in their meat locker and dry age the beef. The results are a beef experience that is religious.Deep rich beef flavor with that Umami sensation. (I used the term Umami for the hipster readers).Oh, did I mention honest to goodness corn-fed beef. This is our 'Gold Standard' for prime rib. We plan for the Christmas meal months in advance. This involves calling Willowside and placing our order. We ordered a three bone roast that weighed seven pounds. The butcher cuts the roast away from the bone and then re-ties it together. This works perfect for ease of carving after the cook. The strings are cut and the roast falls away from the hot and slippery bones. Ask your butcher to cut and tie the roast and usually they are happy to oblige. Pre-ordering our roast insures delivery because Willowside becomes very crowded at this Holiday time. Availability is limited. We unwrapped our roast. This is a 'Choice' grade hunk of meat. The fat marbling is spectacular. 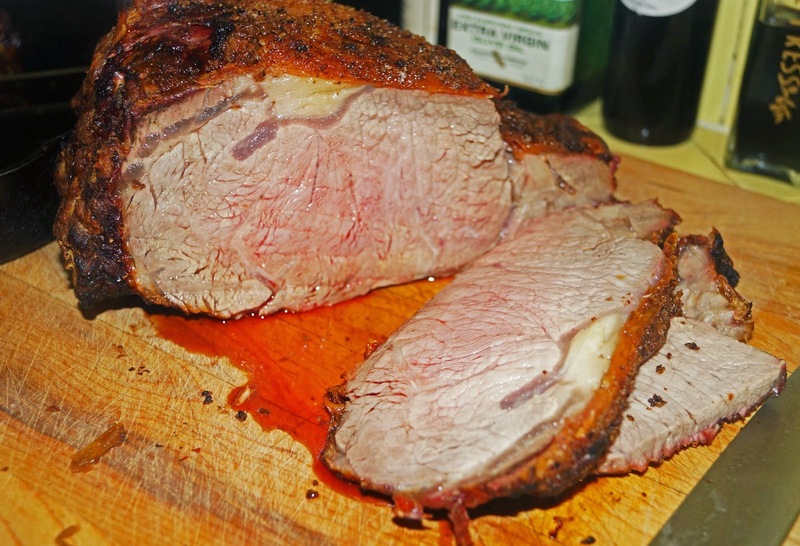 We have tried the 'Prime' graded roast and found it to be to fatty for our taste. This roast will be seasoned with only coarse salt and freshly ground pepper. We do not want to mask any of the luscious beef flavor with seasoning rubs. We have tried several cooking methods and this one works for us. There is no wrong way to cook but it would be a sin to overcook this special meat. 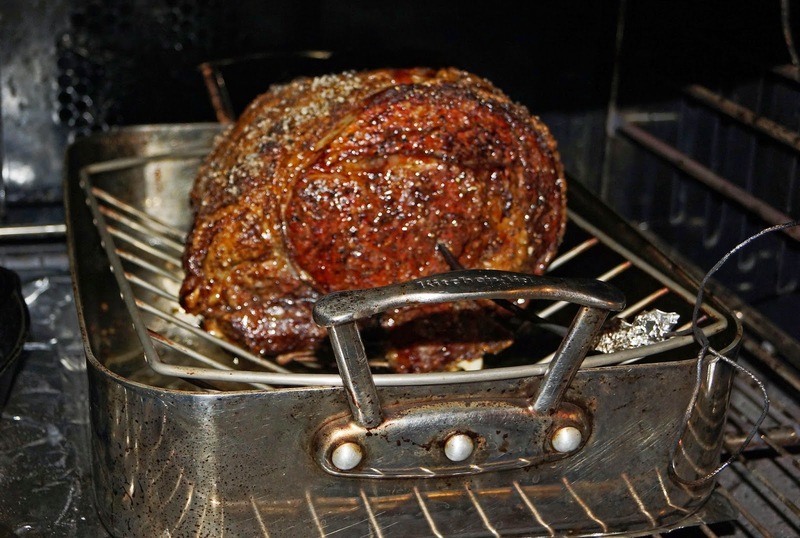 The seasoned roast is put in a roasting rack and placed in a hot 450 degree oven for 1/2 hour. After the 1/2 hour the heat is lowered to 325 degrees for the duration of the cook. Our roast cooked for almost 2 hours until the internal temperature reached 122 degrees. This next step is crucial and difficult to carry out. 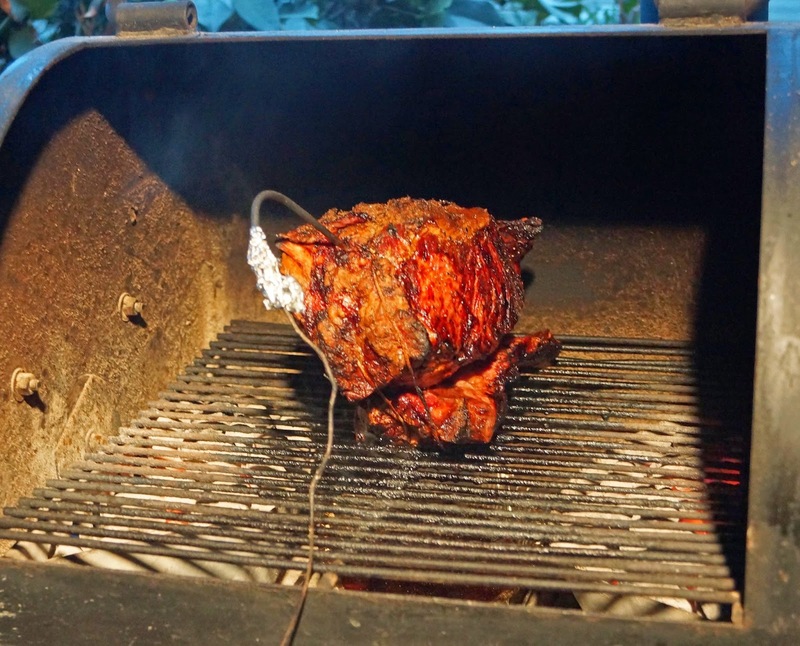 Let the foil tented roast rest for 1/2 hour. This is a torturous procedure because the aroma is intoxicating. This allows the roast to settle and the juices to redistribute throughout. This was one of the best Prime Rib roasts ever. This is our Christmas tradition that we are proud to share with you. We are going to have some of the best sandwiches ever today. 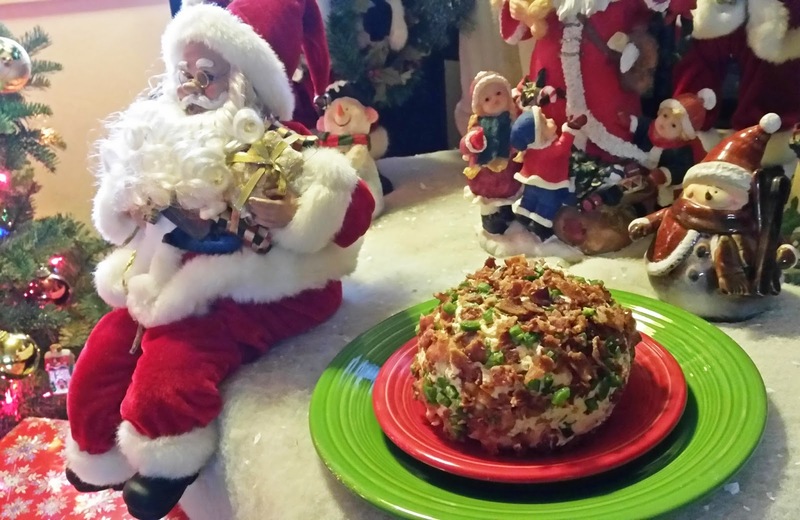 We hope you had a wonderful Christmas and thanks for coming into our kitchen. 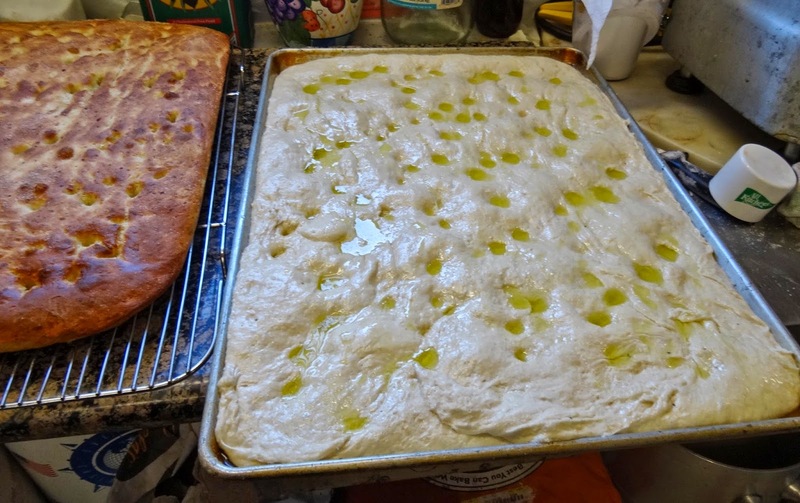 Twas the night before Christmas and all through the house, we were dreaming about Angelo’s focaccia bread. 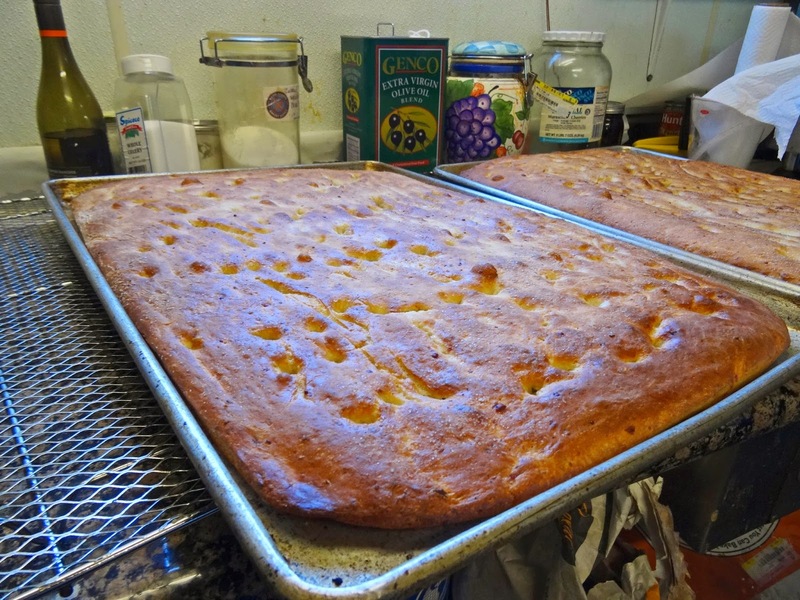 I am not sure if focaccia bread has any ties to the Holliday season but if you ever get the chance to sample this magical treat you will understand its festive power. Angelo Ibieto is a butcher by trade. He is a good friend. He is a man with a gift of making people happy. We have always enjoyed visiting with Angelo on our meat excursions. In the last several years we have discovered a baking talent Angelo possesses. In particular, is his focaccia bread making skills. This focaccia has an olive oil rich crust with a slight chew. The interior is soft and fluffy. There is a hint of garlic. The top is lightly dusted with salt to make you crave and anticipate the next bite. This is the best focaccia ever. We were on a ‘Meat Adventure’ to pick up a Holiday ham. ‘Angelo’s Meats’ smokes a wonderful ham that we enjoy. The Racing Honda flew faster than Santa’s sleigh on Christmas Eve to arrive at our destination. Rudolph has nothing on Ms. Goofy’s red toed foot. We arrived and tore open the shutter, and threw up the sash. St. Angelo was no where to be found. Kristi, in her Christmas ‘Forty Whiner Niner” costume, told us to go back in the kitchen to find Angelo. To our pleasant surprise Angelo was in the kitchen baking his infamous focaccia bread. Have you ever smelled bread baking? This was the aroma we inhaled when we stepped into Angelo’s magic kitchen workshop. Angelo greeted us with enthusiastic joy. We then witnessed the magi at work. Angelo will not reveal all of his secrets. He did tell us to use the best olive oil and do not be stingy. 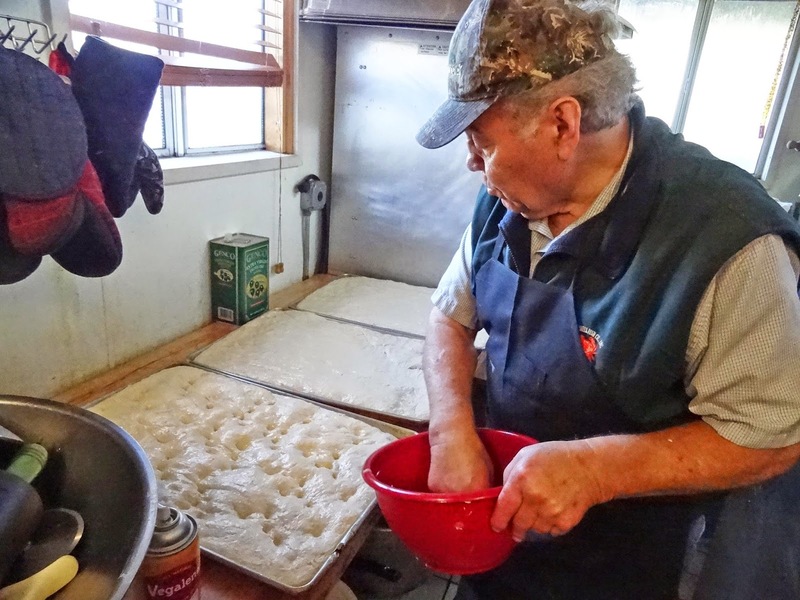 He also hinted that he lets his focaccia rise twice to achieve the pillow like soft texture. He danced with ninja like skill maneuvering the five sheet pans in the commercial convection oven. 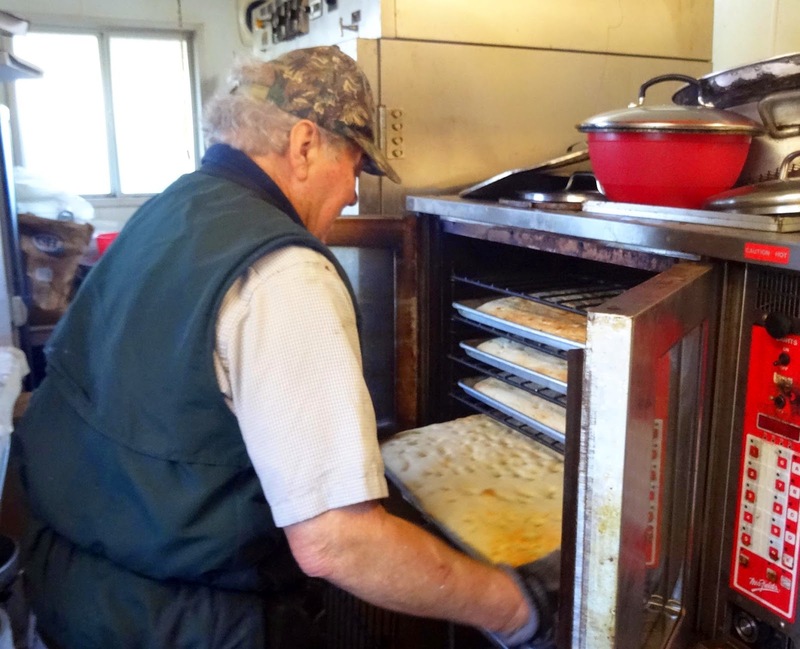 He rotated and sorted the pans to achieve perfect browning of the bread. What a treat to the senses when he pulled the bread from the oven. We experienced a focaccia facial steam bath in Angelo’s small kitchen. It is hard to leave and say goodbye to Angelo. We left with a ham and still hot focaccia bread. Once again Angelo has made us happy. It is always a great Meat Adventure to Angelo’s Meats. You too can experience this wonderful focaccia. You will have to call first because this is a very special item. Be sure to tell Angelo that the Mad Meat Genius sent you. 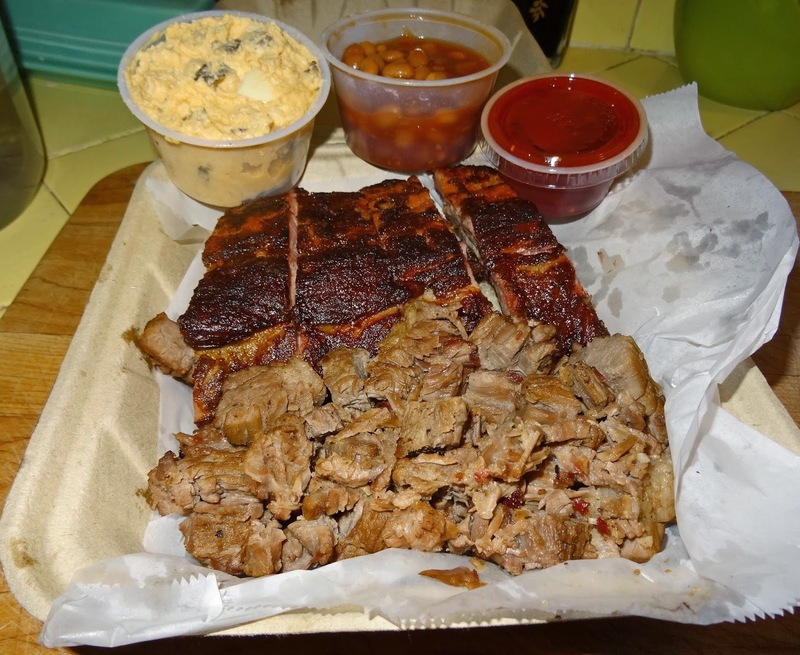 Sometimes what makes a great bbq restaurant is the sum of the whole package. We travel to Oakland, Ca. to sample the barbeque at the BBQ Hut. 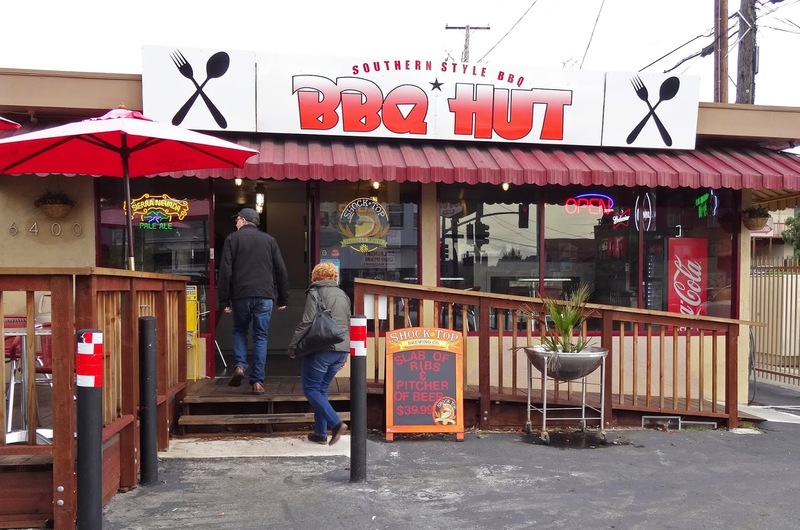 The BBQ Hut is located in a once gritty neighborhood at the Berkeley/Oakland borderline. It is housed in a remodeled old liquor store. I actually remember this liquor store from my long past youth. You could not help but remember it because it was like a fortress in its surroundings. The store was surrounded by iron gates. You would go into the store which only consisted of a window situated in very thick Plexiglas. Your liquor or sundry items were ordered through this window only. Times have changes as the neighborhood. The iron gates remain but now the BBQ Hut is a bright addition to this new evolving, part of town. The outside is colorful with an outdoor table that was occupied by a local couple. They greeted me and told me to be prepared for some good ‘Q’. We talked about the neighborhood and the they then recommended the ribs. I went inside to a bright clean order area. It was not dark and formidable as it past. One thing that made this place so welcoming was the owner Earl. He greeted me at the counter with a smile and warmth that made me want to like this place. He asked me if this was my first visit. I told him only when it was a liquor store. We started talking about the neighborhood and eventually got to the all important subject of bbq. Earl was very proud of his product. He gave me a rib to sample his house made sauces. I ordered ribs and brisket, my standard test dish of unfamiliar bbq joints. Earl does not skimp on the meat proportions. 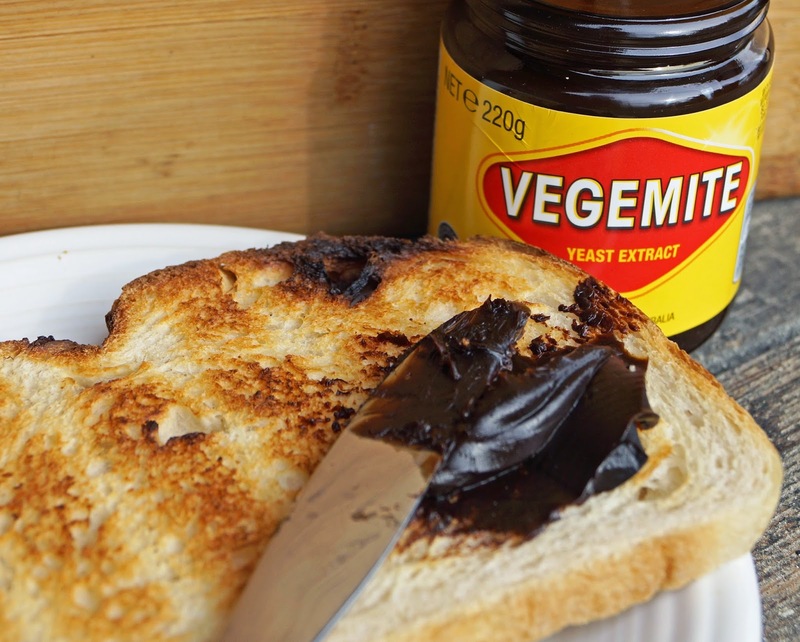 The meats are served on the traditional slices of white bread. 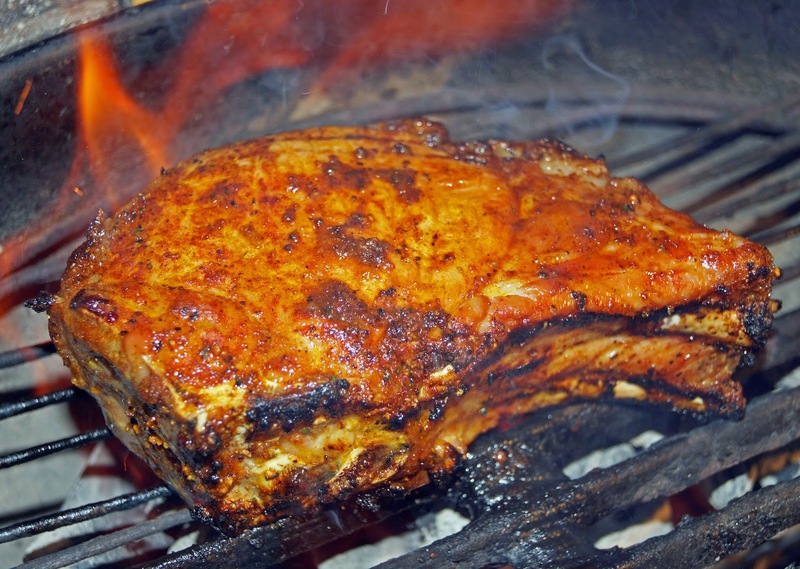 Baby back ribs are the ribs of choice at the bbq hut. They had a nice color produced by the seasoning rub. There was a faint aroma of smoke. These ribs were cooked to perfection. A bite was taken and a gentle tug pulled them away from the bone leaving my bite impression. Earl had two house made tomato based sauces. They were sweet with sugar and given a liquid smoke kiss. One had a hint of pepper but was in no way hot in my book. I wanted to love the brisket. It was chopped. It had smoke and beef flavor. Unfortunately it was tough and chewy. Oh my! The beans were very sweet. The potato salad had big chunks of potato in a creamy sauce. I asked Earl if I could take a photo. He said; “Sure, but wait, I want my son to be in the picture too”. There is a lot of pride and love at this establishment. I felt welcome and want to return. They sell several beers on tap. It would be nice to sit on the patio, eat, imbibe and watch the neighborhood walk by. There were some hits and misses in the food department. I would return for the ribs. 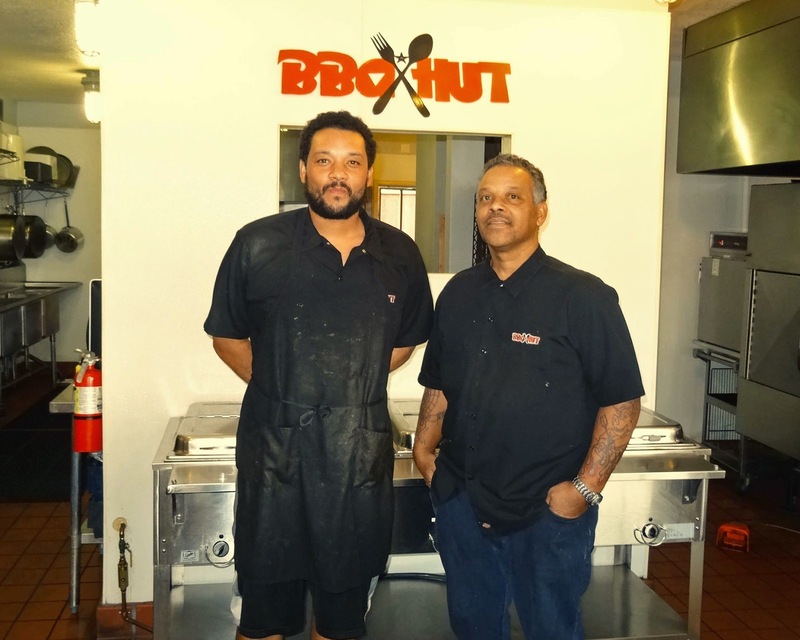 The BBQ Hut is a local neighborhood gem. Here is a fun and easy appetizer. 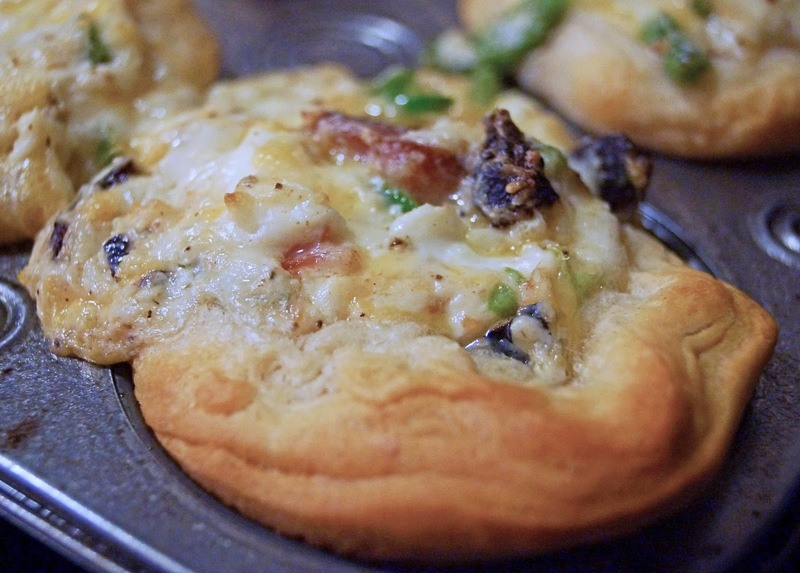 It is a take on a ‘Jalapeno Popper’ with bacon of course. 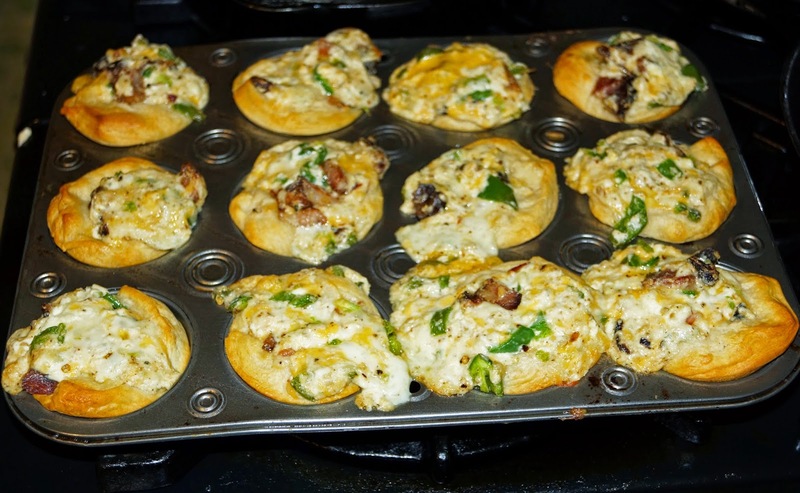 Cheese, jalapenos, and bacon are baked with refrigerator bisquits in a muffin pan. Simple, but with a ton of rich, ooey goodness is this appetizer. I call it deconstructed because it sounds fancy. The jalapenos with its mild to medium heat are the perfect compliment to rich cream cheese. We throw in some Jack cheese to make it over the top decadent. Wait a minute. Did I mention bacon? Salty, meaty bacon is the star as far as I am concerned. 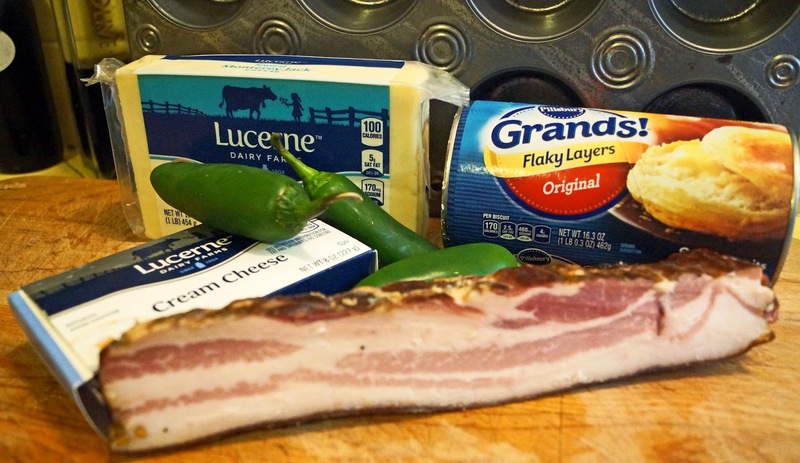 Let’s make some de-constructed bacon jalapeno poppers. Cook your bacon until crisp and let cool. You can use the bacon fat to grease your muffin pan. (Non-stick spray could be used but why would you want to waste bacon love). Combine the cheeses, jalapenos, salt & pepper and chopped bacon. Pop open your refrigerator rolls and separate rolls in half. They will peal apart fairly easy. Line each muffin tin with dough. Place cheese and bacon mixture into center of dough. Bake in a 350 degree oven for 15 to 20 minutes or until cheese is melted and bisquits are browned. See I told you it was easy. This mixture of ingredients will meld together to form a wonderful appetizer for any party application. These even taste great the next day. I ate them cold and really enjoyed them. Ms. Goofy would have no part of that and reheated them to even greater glory. Once again bacon saves the day. French fries, cheese curds and gravy sounds like some of my favorite food groups. North of the border, Quebec in particular they are combined and given a fancy title called Poutine. This so-called Quebec classic has been getting a lot of publicity lately. In Berkeley, California, ‘Smoke’s Poutinerie’ is a new chain restaurant to open in this non-hipster but possibly aging hippy college town once known as the birthplace of the ‘Free Speech Movement”. 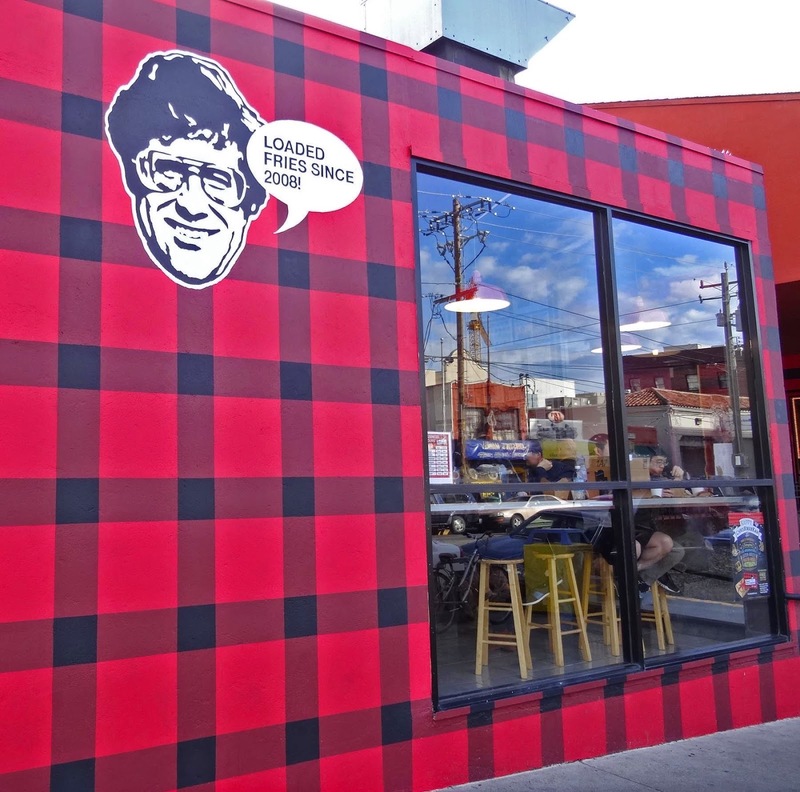 We will be visiting Smoke’s Poutinerie for strictly academic purposes to see what all the hub bub is about. 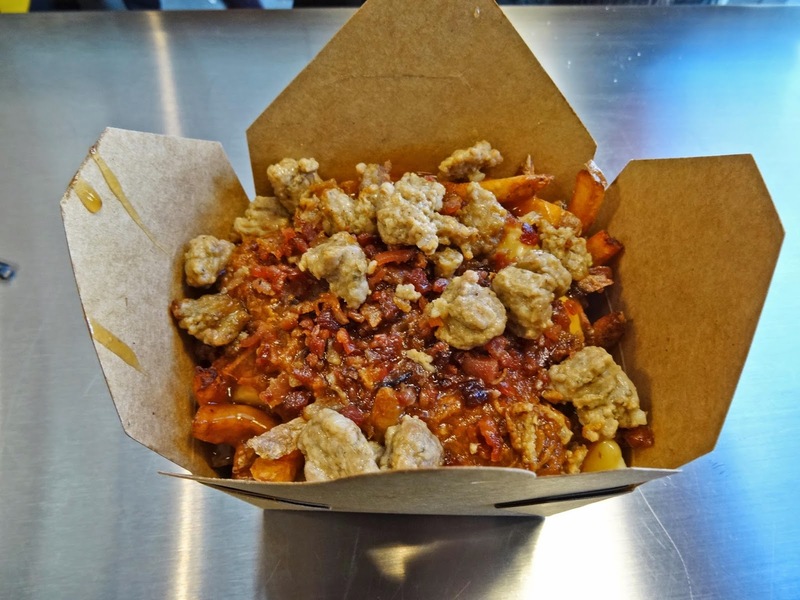 Smokes Poutinerie is located one block off of Telegraph and a stones throw away from the infamous ‘Peoples Park”. This neighborhood is full of restaurants, record stores, head shops, and clothing stores all catering to the college crowd. Smoke’s Poutinerie is a very small shop sandwiched right smack in the middle of all the action. The streets are crowded and so is Smokes. There are no tables but several counters to stand and eat your poutine meal. 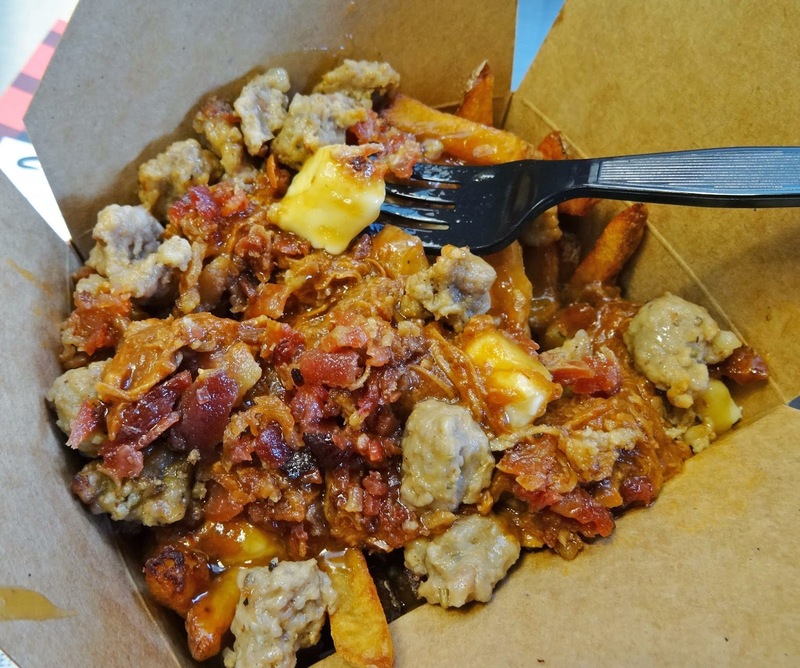 Smokes offers the traditional poutine of fries, curds and gravy, but also has numerous other toppings to add. Some of these toppings are chicken, pork, beef, and even an all vegetable combination. The prices are low for the college crowd. I found a “Triple Pork” topping which consists of bacon. sausage and pulled pork. The order was placed and almost immediately my number was called to retrieve my meal. Your order comes in a Chinese style take out box. It is full to the brim of fries and your toppings. I squeezed into a small spot at the counter and dug in. This was an exercise in calorie overload. This Mad Meat Genius has an appetite that can challenge any trencherman and I was put to the test. The fries were hot and fresh. They were drenched in pulled pork with a sweet barbeque sauce. The word sweet needs to be emphasized. The sausage was plentiful and tasty. I could see bacon pieces but the flavor was overshadowed by sweet bbq sauce. The cheese curds added mostly a texture component. They also added to the overall bulking up of this filling caloric bomb of a meal. 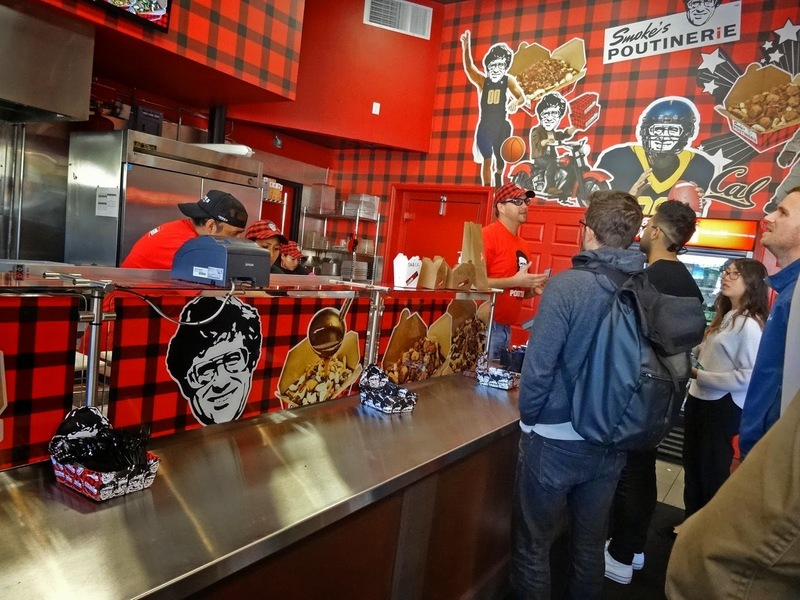 Smokes Poutinerie has all the right move to be a success. They are located in a bustling student area. The prices are very reasonable. This was a very filling meal. The food was more than generously proportioned. The flavors were decent. There is a combination on the menu for everyone. I wanted to try some Poutine. I did. It really was not something I would come back for. If I ever was a starving college student again and it was late at night, then by all means Smokes Poutinerie would be my go to spot. Do old hippies turn into new hipsters? 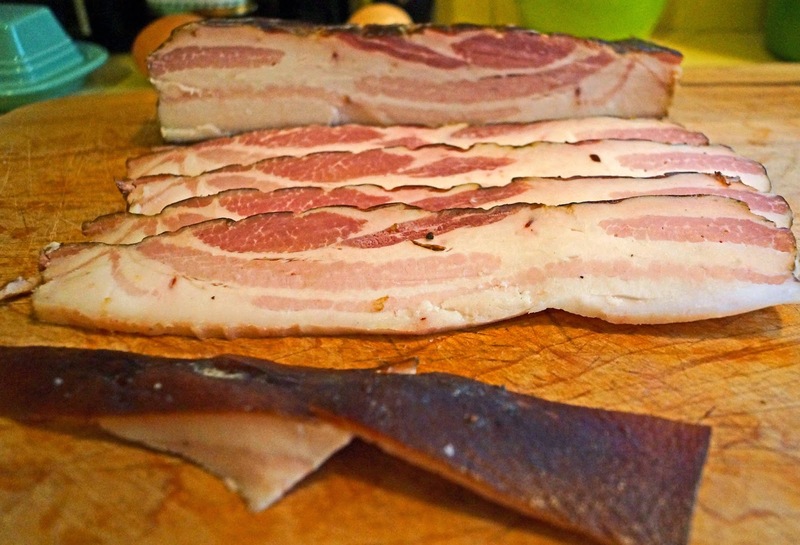 A recent trip to the newly opened Clove & Hoof procured some Berkshire bacon. We may have been the first customers to actually purchase some of their house cured and smoked bacon. While chatting with Jason the butcher I inquired if they were going to sell bacon. He said; ' let me check' and when he returned he had a dark hunk of 'Burnin Bacon Love' in his hand. This slab had been smoked with a combination of smoking woods with no particular variety in mind. The rind was on. If you have read previous bacon stories you know that I am not a fan of the rind. Smoking with the rind on limits smoke penetration to the meat. The rind is indelible unless you have jaws of steel or you like to swallow gum. To be fair the butcher asked me if I would like it removed. We purchased a couple of pounds and hurried home to try it. The small slab that we purchased had a very slight suggestion of smoke aroma. The meat to fat ration leaned towards the fat side. You could see the quality of Berkshire in the fat color. It was not chalky white as in super market variety offerings. 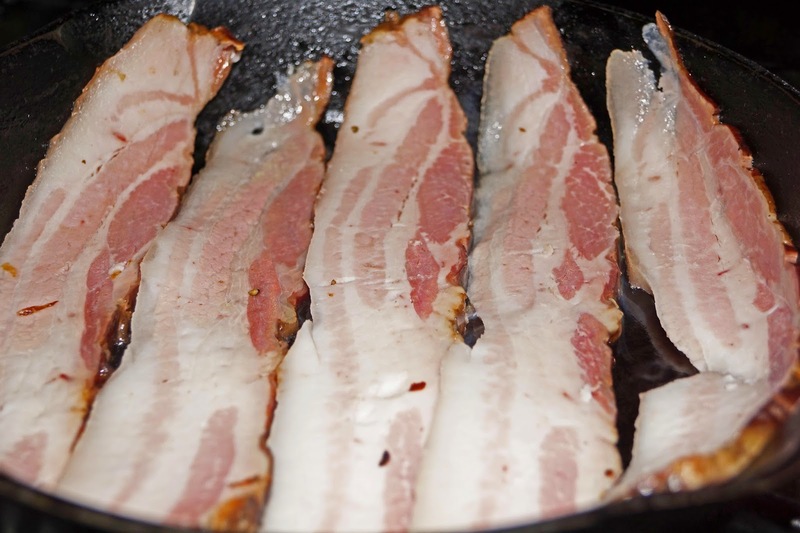 Our trusty black iron pan was put to use crisping our rashers for the future pleasure to come. 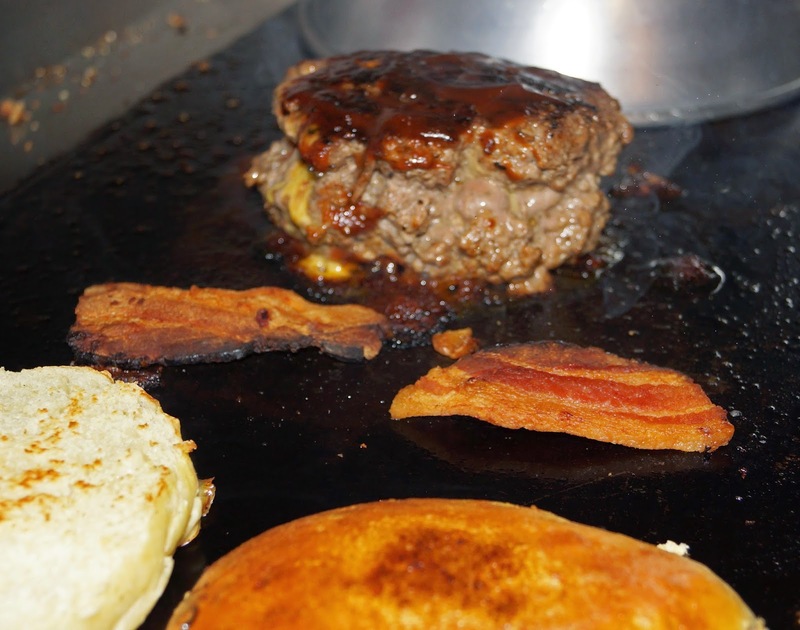 The cooked slices were placed on a paper towel to drains any excess bacon love and cool.. Drum roll please, how did it taste? The bacon crisped up very nicely. This bacon had an almost mild beefy flavor. The Berkshire breed of pig has a flavor of pork that makes you appreciate, crave and savor porky love. The all important balance of sugar and salt was spot on. Ms. Goofy gave the paws up approval. This bacon was not perfect. The rind was on, smoke was faint and it was not the meatiest bacon but the flavor of Berkshire pork trumps all. This was very flavorful bacon. I also believe Clove & Hoofs offering of bacon will evolve as their butcher shop matures. We cannot wait to try some more. Twice a month this Mad Meat Genius manages the Richmond Farmers Market. One fantastic perk of being involved with the market is coming home with the freshest in season produce. Persimmons are in the market right now There are two different varieties of persimmons the Fuyu and Hachiya. The Fuyu variety can be eaten crisp like an apple. The Hachiya needs to be fully ripened to the soft stage before it can be eaten.The Japanese have a method of drying the Hachiya called Hosigaki and is considered a delicacy. These persimmons are air dried and believe it or not periodically massaged. This is a labor intesive process hence a high price tag if you can even find them. This sounds like a good experiment for me. As some of you may know I am a big fan of the late great Huell Howser. He is my inspiration for this experiment. 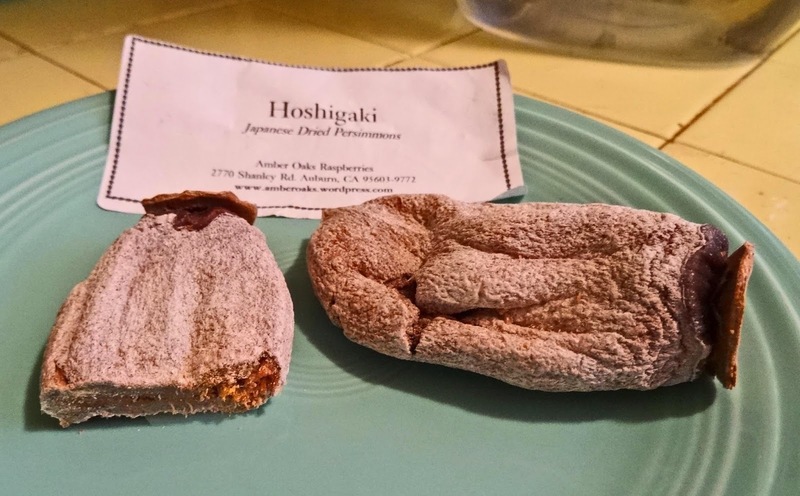 He toured a persimmon farm and they created Hosigaki. There is a link below if you would like to watch this episode. The process is fairly simple. 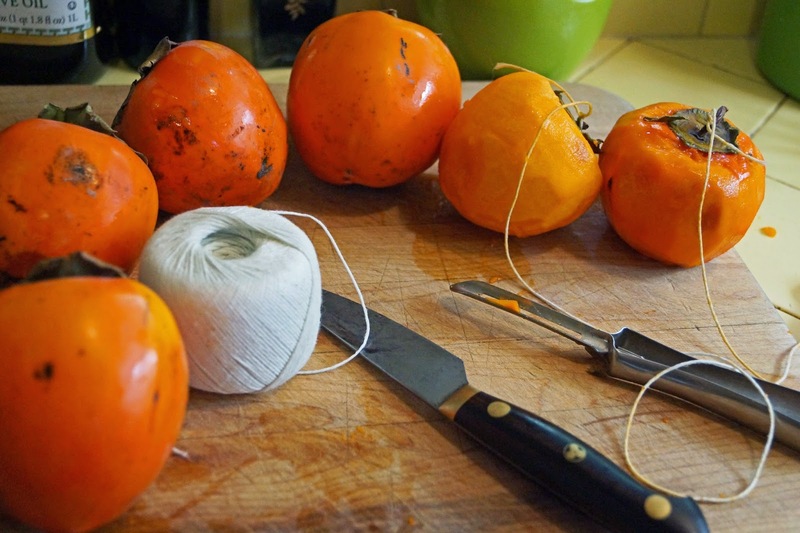 You peel the Hachiya persimmon. A string is tied around the stem. 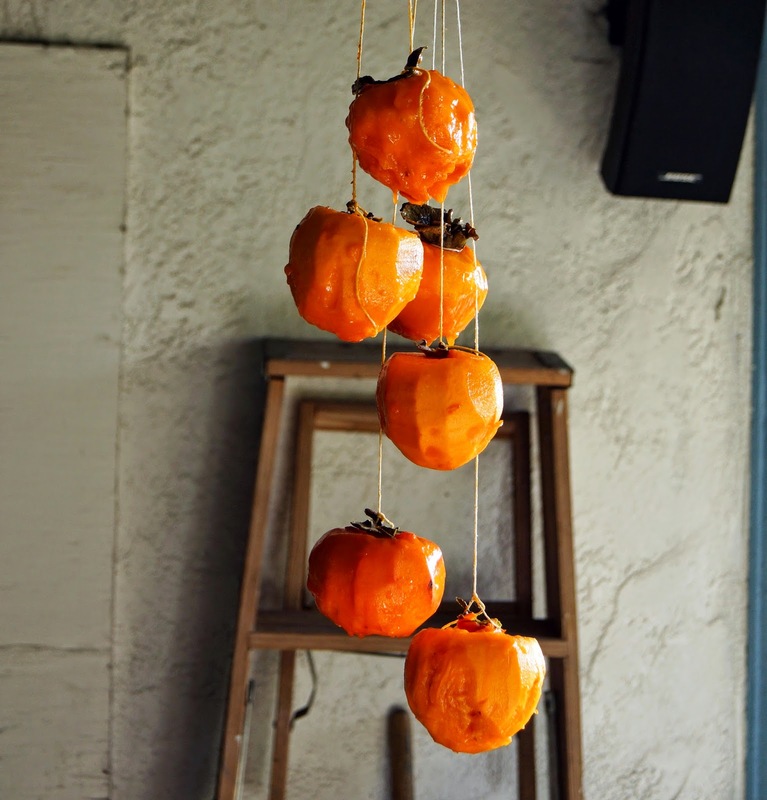 The stringed, peeled persimmon is hung in a dry warm place. The first week they are left alone. Then for the next several weeks they are then gently massaged until they are dried to the desired texture. This can take up to two months. I have done the initial steps. Stay tuned and hopefully we will have created Hosigaki. 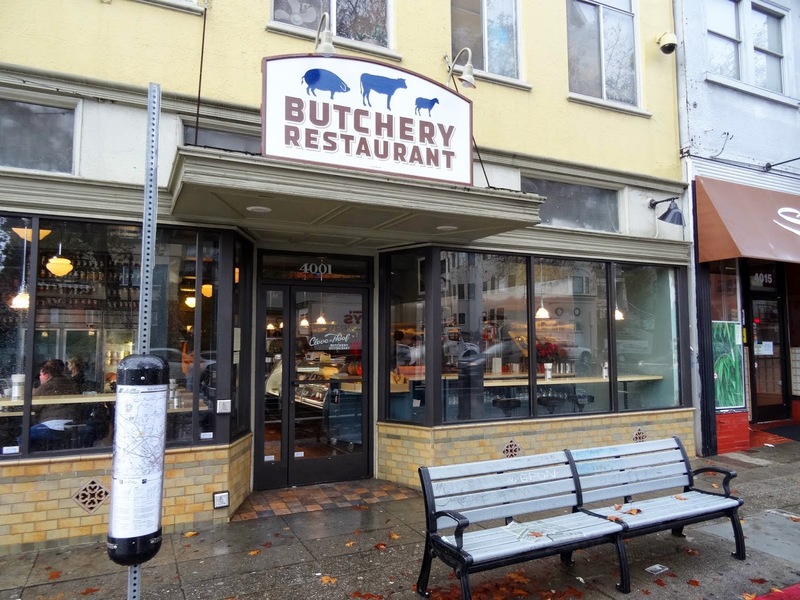 We are excited to hear about a new restaurant slash butcher shop that has just opened in my old hometown of Oakland California. 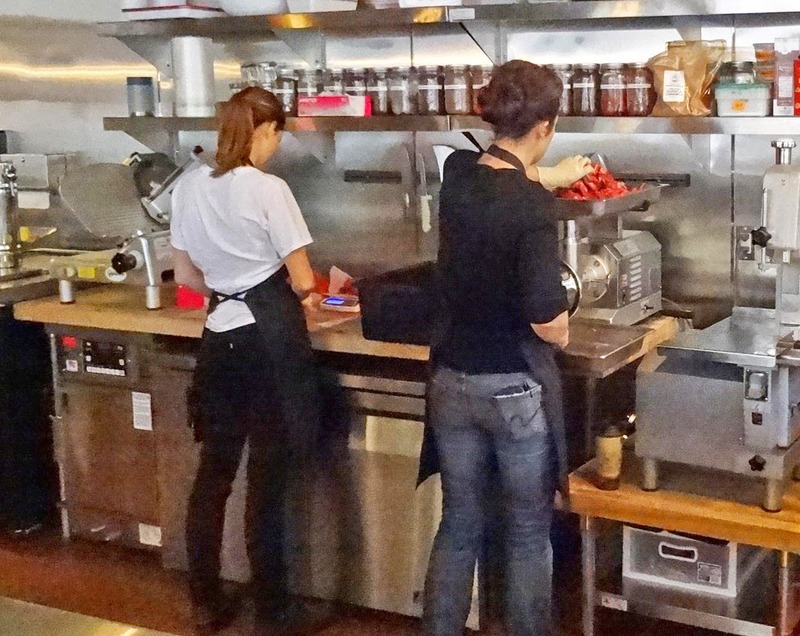 Clove & Hoof have opened their doors in the hipster Temescal district. When I was growing up we just called it the poor part of town. Not anymore. We put on our galoshes, put the rain slicks on the Racing Honda and slogged through the water logged freeway to the Clove & Hoof. I believe my parking Karma has returned because we found a parking spot two shops down. I could not park in front because of a silly bus stop. We arrived a little after their 11:00 am opening to a bustling beehive of employee activities. There were only a few customers at this time of day because you know, hipsters are late risers. There were several meat counters showcasing some wonderful looking cuts of meat. There was an open kitchen presenting cooking and meat preparation activities. One employee was grinding sausage. 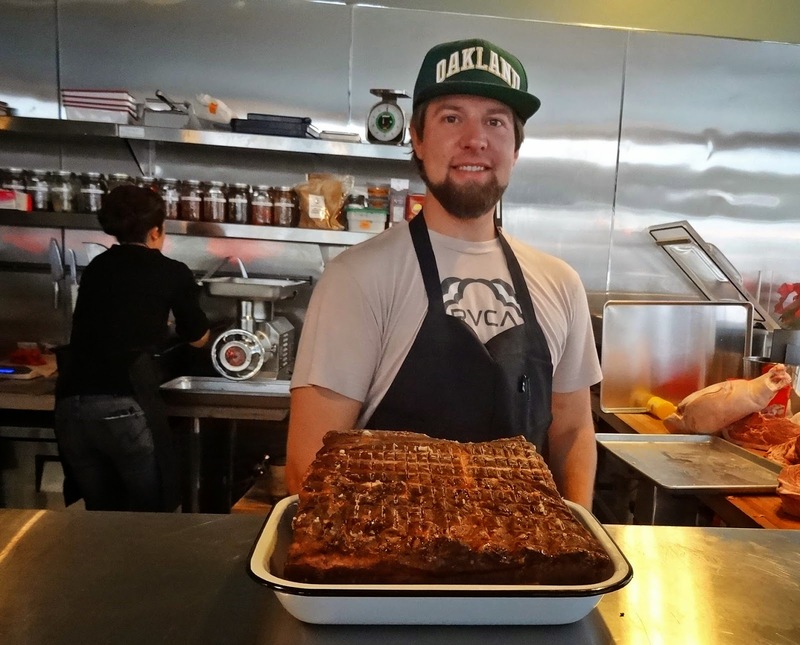 We chatted with Jason who was butchering a whole Berkshire hog. It was fun talking to Jason who was a fan of Mad Meat Genius. We also had quit a few mutual meat acquaintances. The community of butchers is a small group of people. 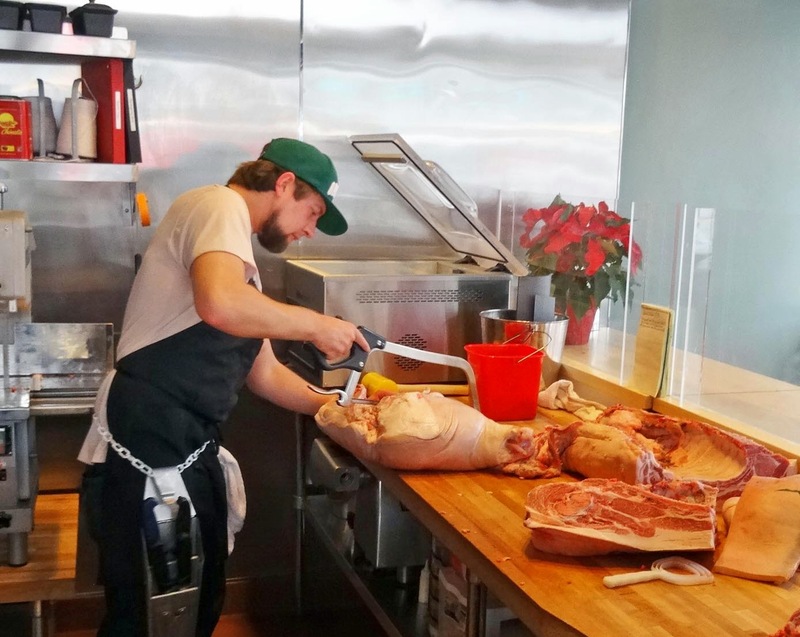 Clove & Hoof has embraced the concept of locally sourced whole animal butchery. Charcuterie, sausage and bacon are house made. The owners Analiesa Gosnell and John Blevins both have past experience in high end local butcher shops. At this moment the beef is sourced from Jenner Family beef in Siskiyou County. 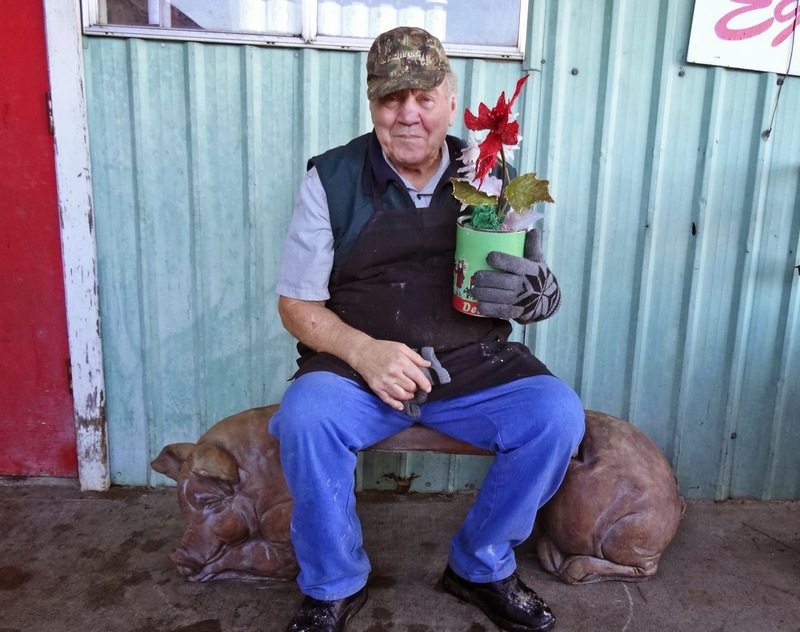 We are familiar with Siskiyou County because of the Montague bbq competition. The restaurant is only open for lunch now. Hearty sandwiches are the main focus in the early opening stages of this new establishment. We purchased a beautiful Berkshire rib chops and some of their first bacon. We had the rib chop for dinner and it was spectacular. Clove & Hoof has only been open a couple of weeks. I am sure this place will evolve and find its niche to settle into the neighborhood. It is kind of fun to return to an old neighborhood that has transformed into a hipster destination. With its new identity comes a premium price tag reflected in our meat tab. In the future we plan to return to explore and sample more meat offerings and possibly lunch. Who loves chicken wings? They are the perfect finger food for parties, tailgates and just a little snack. Chicken wings can be prepared in numerous ways. Wings can be a vehicle for a multitude of spices and sauces.We have found a convenient and easy product to satisfy our wing cravings. 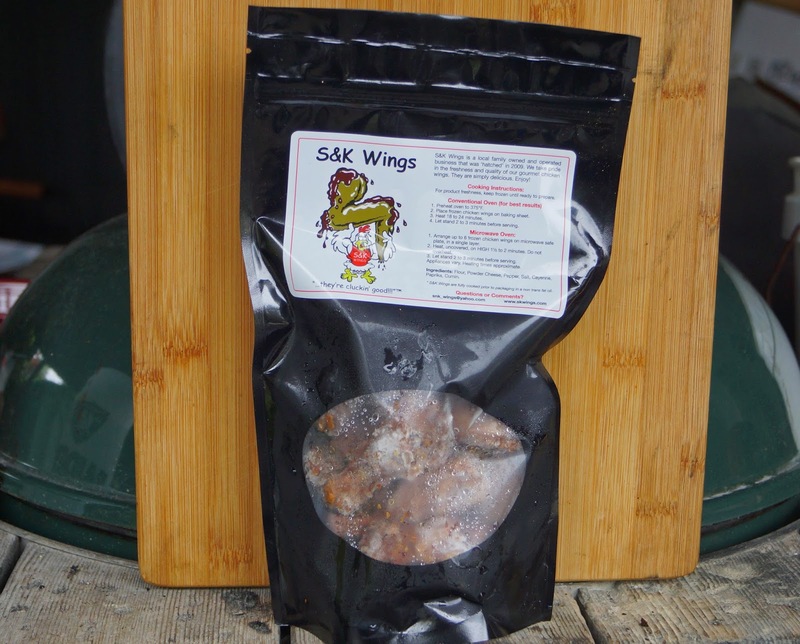 S & K Wings is small family run company that sells frozen cooked chicken wings at our local farmers market. They are based in Pinole California which happens to be our neighboring town. They claim to be gourmet wings. They are sold in a bag frozen and are included with a fresh dipping sauce of your choice; " sweet and smoky BBQ, creamy BBQ Ranch, Chili Lime and Butter Parmesan. We bought a bag for research purposes. The cooking instructions could not be simpler. Heat in 375 oven for 20 minutes. Let the wings rest for several minutes and enjoy. We did enjoy them. We dipped them in the smoky BBQ sauce that was included. The wings were breaded with a nicely seasoned crust. There was a hint of cheese and peppers in this crust. It had a mild heat that only suggested pepper warmth. These were tasty wings. Ms. Goofy loved them. If we could find any fault in this product was the size of the wings. These were tiny little things. You barely got a bite out of each one. 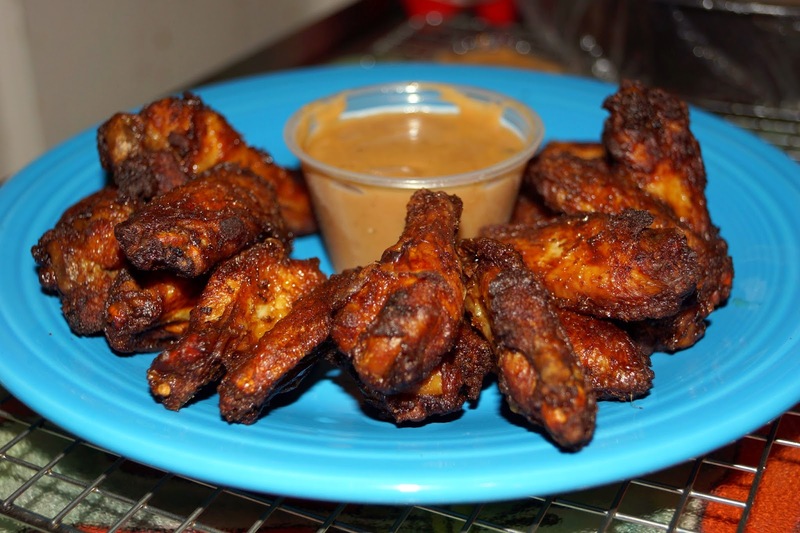 S & K Wings are a convenient easy way to enjoy some wings. Turkey and stuffing, stuffing and turkey and turkey and stuffing has been our nourishment these post holiday days. It was time for some beef.relief. What better than a beautiful hunk of beef rib roast from Willowside Meats in Santa Rosa. 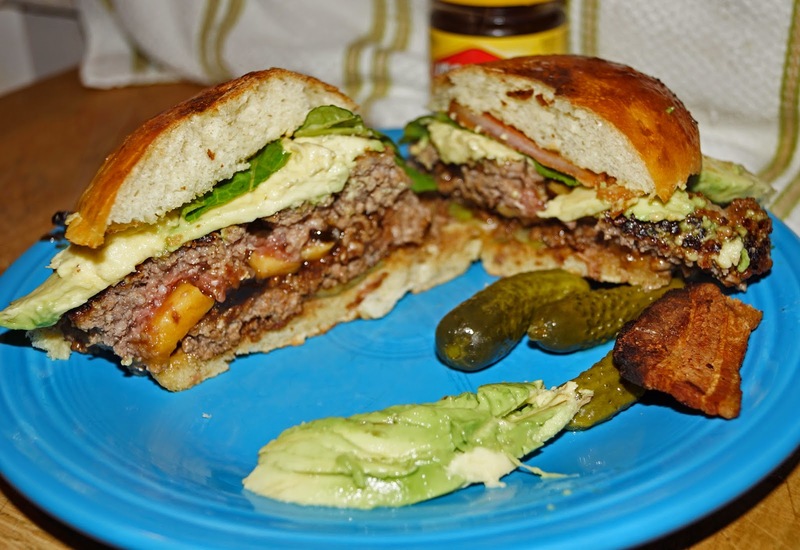 Willowside Meats specializes in aged corn-fed beef. It does not get any better than this. We happened to be in the neighborhood when we picked up the Great White Hunters Willie Bird. 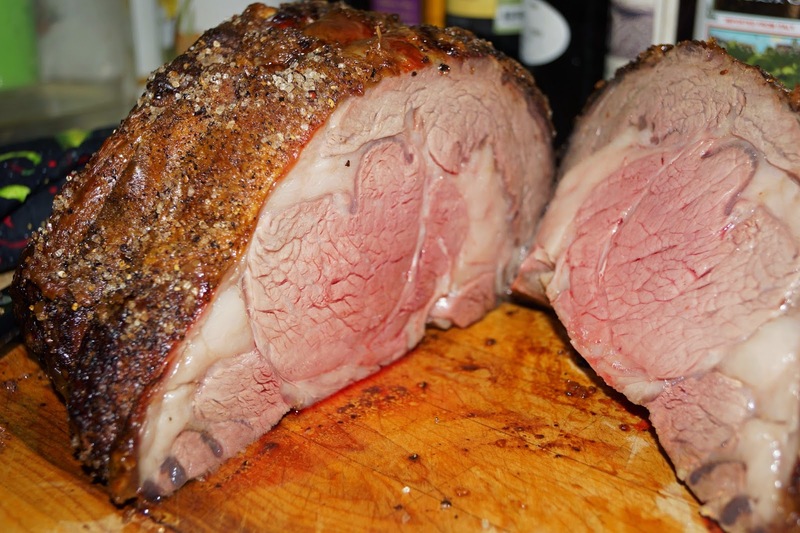 It is that time of year to place our order for a prime-rib roast for Christmas. So that is what we did. This two bone, 4.5 pound roast was proudly displayed beckoning me to purchase. It was not a hard sale. The butcher cut the bone from the roast and then retied it for easy, peasy carving. This roast is not prime-rib. 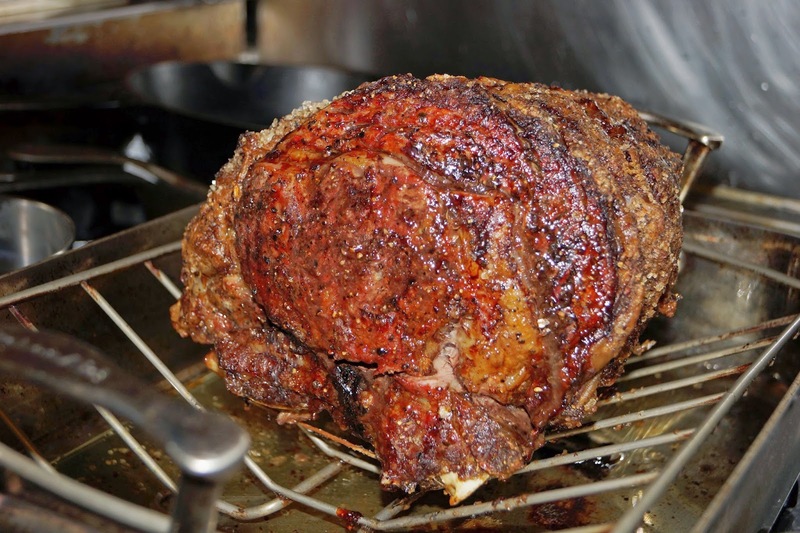 It is a rib roast with tons of flavor. It does not have the fat marbling of a prime roast. With the proper cooking it will be a roast fit for a king. 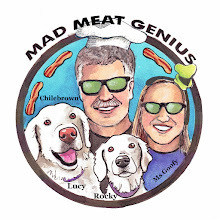 (Mad Meat Genius). 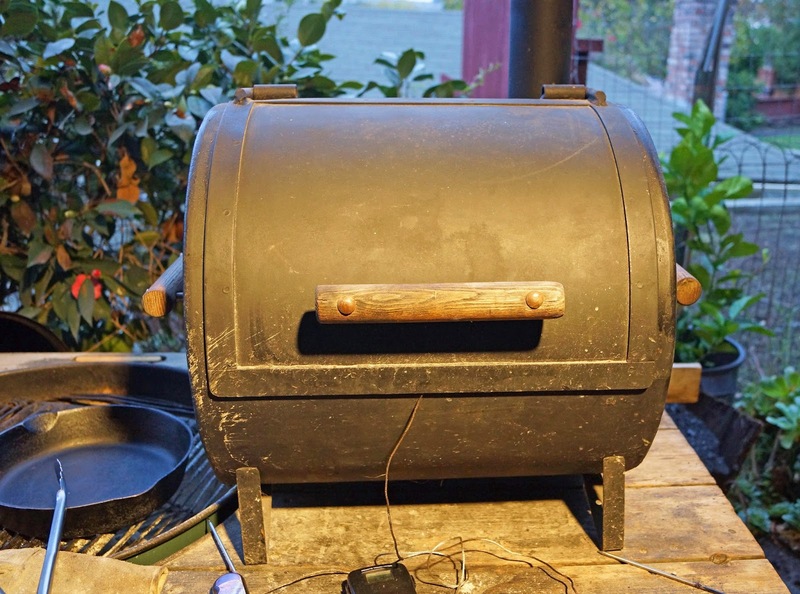 We are going to use one of my favorite smokers/grill. It is a custom New Braunfels model that I have faithfully up-kept through the years. I have been rewarded with numerous successful cooks. Our roast was coated with a generous dusting of sea salt and freshly ground black pepper. The roast was cut and tied so we were ready. 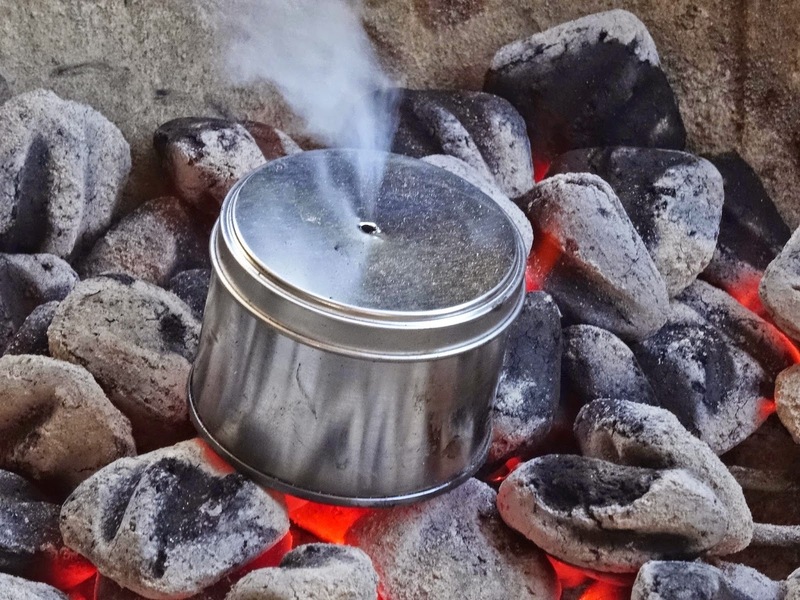 An indirect charcoal fire was built and it was time to cook. The roast was pulled when the internal temperature hit 125. A painful resting time of 20 minutes tested our patience. We were rewarded with wonderful, tender, beefy meat that rocked our world. This roast had all the right moves. I cannot wait for a sandwich tomorrow.